The versatile Compack 7" Adjustable Metal Bed Frame is designed to provide optimum stability and support for any twin, full or queen box spring. The center bar and nine-leg construction are unique to the Compack bed frame and offer reliable stability and support. This item provides low-stress easy assembly. 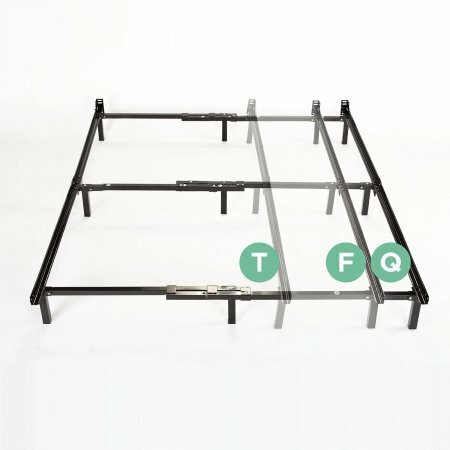 The steel bed frame comes together in a few simple steps with each bar featuring a quick-lock system. The legs are intelligently recessed for safety and so you can avoid hitting your toes when changing your sheets. It also comes with headboard brackets as well. Pair this item with your choice of mattress. Add your coordinating comforter, pillows and accessories to complete the look of your room.